One of my big goals for this school has been to expand science education in my classroom. I’ve always given my students a pretty healthy dose of science, but much of it came in the form large group activities and discussions. Every year, we learn about many scientific topics, and we run many experiments as a group. But we lacked a dedicated space where children could independently engage in scientific activities on a regular basis. So I rearranged my classroom and made room for a new science center. Magnifying Glasses. Probably high up on any list of scientific tools. I got a few different kinds of magnifiers. These standard magnifying glasses have both 3X and 6X magnifiers on them. However, it takes a little bit of skill to focus them. Many students prefer to use these little “bug boxes” or these “pre-focused” magnifiers. I usually set them all out. Rulers and Tape Measures. Which type probably doesn’t matter much. I got these translucent rulers and I already had some small tape measures that work well. Scale. Instead of a balance, I decided to get a scale. Young children tend to want to fill balance buckets with as many objects as possible, which becomes a bit of a distraction from the concepts they’re designed to teach. 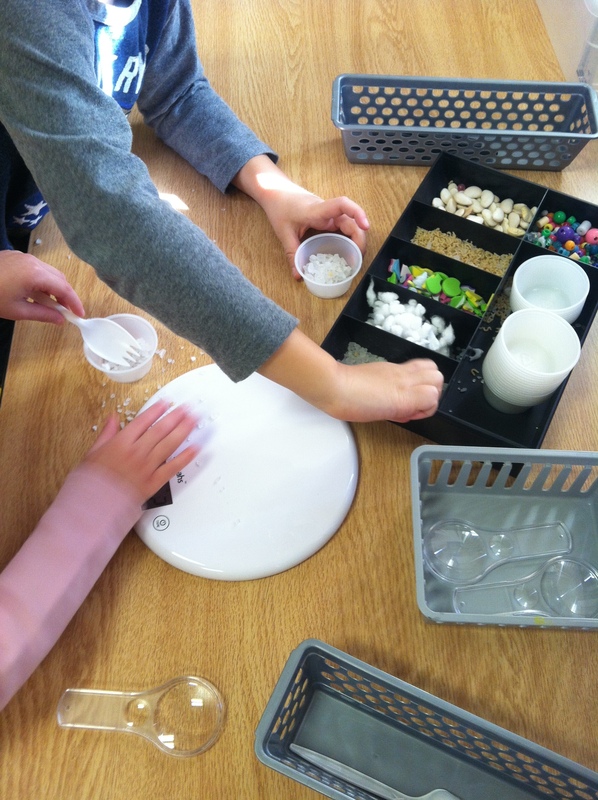 A scale has the advantage of injecting numbers into our science activities. My students can still compare the weight of two objects; it just takes an extra step. (I have a number chart on the wall in the science center, for students to reference.) It was tough finding a good scale. I settled on this digital scale, which has a grams setting. Most digital scales that use ounces or other units show a decimal point, which confuses young students. A digital scale that’s set on grams usually doesn’t include decimals. Small Containers. I gathered a variety of small containers, which we’ll be using to run experiments. Most were old plastic containers I had in storage, but I also purchased these plastic test tubes. Tweezers. We might want to handle some very small objects at some point. I wasn’t sure if the kids would be interested in these tweezers, but they love them. They want to use them for everything, so I remove them when we’re handling fragile objects. Stop Watch. I’m still unsure how exactly we’re going to use this, but I want to give my students some experience measuring time. I purchased this timer because, as with our scale, it doesn’t show decimal points. Acquiring new tools was the easy part. The challenge has been preparing a steady series of interesting activities for my students to engage in. There are a lot of early-science resources available, but they often have limitations. Most of the activities I’ve found fit in one of two categories: (1) run an experiment that is largely teacher-directed, or (2) offer various items (often from nature) for students to examine. Teacher-led experiments we do carry out regularly, but they don’t fit well in a learning center that’s driven by student choice. Exploratory examinations are going to be a regular fixture in our new science center, but they lose their appeal if offered too regularly, and I don’t want to stop there. I want my students to manipulate things and make simple comparisons. I want them to interact with objects, come up with ideas, and then test their ideas. Young children can understand the scientific method at a basic level; they’ve shown me consistently. They’ll learn it even better if I give them abundant opportunities to practice. It’s going to take some creativity and some hard work, but I’m looking forward to the challenge. Stay tuned for updates on my recent efforts. I’m glad I’m not the only PK teacher wondering how to create a science/discovery center that’s child directed. This has been the one area of my classroom that has always been a challenge. I look forward to reading updates on your efforts.